Skiers and snowboarders of New Mexico, rejoice. It doesn’t matter whether you like to get your whoosh on in the northern or southern part of the state—capital improvements abound. Ski Apache and Ski Santa Fe greet this season and their guests with state-of-the-art lifts and lodges that take the experience up several notches—and pave the way for many more downslope runs per day. Ski Apache, outside Ruidoso, will be fully operational by its expected opening date of Thanksgiving Day, November 22, with three new chairlifts and some $15 million in capital improvements wholly funded by the Mescalero Apache Tribe. They splurged on an eight-passenger Doppelmayr Gondola, which will climb 1,646 feet to the mountain peak in just eight minutes—twice as fast as its predecessor. The only gondola lift in the state is expected to carry 2,000 skiers and snowboarders to the top every hour. Other additions to the fleet are Doppelmayr triple and quad chairlifts, which will whisk 3,600 more skiers to their trail heads each hour, giving Ski Apache the highest lift capacity in the state. Skiers will have to wait until Thanksgiving weekend for most areas to open, but Sipapu Ski and Summer Resort plans to crank up its lifts in early November, making this the ninth year in a row it will be the state’s first ski resort to open. The family-run resort, 20 miles southeast of Taos, is affordable and unintimidating to first-timers and families with children, thanks to its small scale. It offers a wide array of specials, from free lessons for kids to gratis nights in their homey lodging options. Plan ahead for the February Fun Fest (February 16–18), a free family event with costume contests, scavenger hunts, and a two- to three-story snow castle full of slides, steps, and tunnels. On March 16 the ski area will host its annual Cardboard Derby, in which participants construct amazing vessels made only of cardboard, duct tape, paint, string, or twine, then ride them down the mountain, aiming for a bull’s-eye. (800) 587-2240; sipapunm.com. Just outside Santa Fe, cross-country skiers and snowshoers will discover more than 125 annual inches of snowfall and scenic trails throughout Hyde Memorial State Park (505-983-7175; nmparks.com) and along the Norski Trail, near Ski Santa Fe. The Santa Fe Striders (santafestriders.org) sponsor the Santa Fe Snowshoe Classic, a 3.6-mile race, each January. Outside Los Alamos, traverse an 89,000-acre collapsed volcanic crater at the Valles Caldera National Preserve (866-382-5537; vallescaldera.gov). Check the Preserve’s schedule, too, for moonlight skiing events. Chama Valley (800-477-0149; chamavalley.com) offers 10K of ungroomed trails. The city also puts on the Chama Chile Ski Classic (575-756-1926; chamaski.com), on Martin Luther King Jr. weekend. The Enchanted Forested Cross Country Ski Area (575-754-6112; enchantedforestxc.com), outside Red River, offers 33K of groomed trails for ski touring and 15K of trails devoted to snowshoeing. It hosts the Low O2 Challenge January 26–27, a 10K nationals qualifier for snowshoeing, and the more laid-back Just Desserts Eat & Ski on February 23, in which skiers glide to clearings where tables laden with delectable goodies have been set up. Triple-chocolate cake, anyone? Athletes with talents in multiple sports can test their skills at the Mt. Taylor Winter Quadrathlon (800-748-2142; mttaylorquad.org). In this early-February event, competitors bicycle, run, cross-country ski, and snowshoe from Grants to the top of Mt. Taylor. 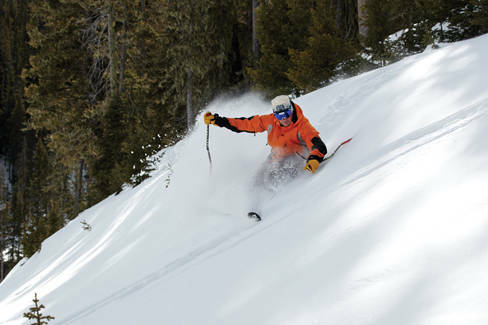 For more information about skiing and snow conditions, consult Ski New Mexico (skinewmexico.com). Those folks looking to get outside this winter for less adrenaline-spiked fun should head to the Valles Caldera National Preserve for a 60-minute ride through the preserve in a horse-drawn sleigh. Roadrunner Tours (575-377-6416; rtours.com) also offers sleigh rides in the Angel Fire area. For those with more get-up-and-go, Bobcat Pass Adventures (575-754-2769; bobcatpass.com) outfits snowmobile tours of the beautiful Moreno Valley between Red River and Eagle Nest. Big Al, of A.A. Taos Ski Valley Wildness Adventures (575-751-6051; bigaltsv.com) leads snowmobiling tours that gain 3,000 feet in elevation and provide 360-degree views of stunning Taos Ski Valley. Families enjoy tubing together at Ruidoso Winter Park (575-336-7079; ruidosowinterpark.com), Angel Fire Resort, and Red River Ski & Snowboard Area (575- 754-2223; redriverskiarea.com). From November through February, visitors can lace up their skates for a turn on Los Alamos County Ice Rink (505-662-4500; losalamosnm.us), a refrigerated, outdoor area set in a scenic canyon. In the south, the charming village of Cloudcroft, which has a ski area of its own, also boasts outdoor skating at the James Sewell Ice Rink (575-682-1229), open mid-December through the beginning of March. At Eagle Nest Lake State Park (575-377-1594; nmparks.com), visitors can dip into icy waters—with their fishing poles, that is. Anglers can fish for kokanee salmon and rainbow trout from mid-December through early March, depending on the ice thickness. The Park also hosts a fishing derby in early January, conditions permitting.